WebSitePulse is a web-based remote monitoring solution to helps businesses constantly track their servers and network components, websites, web applications and email infrastructure all day, every day, the whole year round. This monitoring services provider does testing and verification, ensuring that your devices are connected to the internet, responsive, and deliver the right content to your customers in a timely manner. With WebSitePulse monitoring services, you are able to significantly improve the efficiency of your business operations and drastically bring down the risk of failed Internet transactions and loss of revenue. Their monitoring services include Server and Network Monitoring, Webpage Monitoring, Web Transaction Monitoring, Email Round-trip monitoring, and vulnerability monitoring to mention a few. WebSitePulse ensures that all your websites, pages, and applications are fully operational and provides the content and services your visitors are looking for. With WebSitePulse, your servers and network devices from various locations all over the world are constantly tracked and scoured every minute for errors so that they are immediately addressed long before they turn into major issues. The platform ensures that your servers and networks remain functional while preventing revenue loss due to downtime. People go to your site and consume your content. WebSitePulse helps you make sure that they get their share of content by delivering them in the most timely manner and that download speed remains in compliance with industry standards. The platform also detects any issue pertaining to all your website transactions, allowing you to minimize downtime and know what kind of systems issue you are faced with. WebSitePulse also performs email tests to determine if there are any problems with incoming and outgoing emails, like delayed or lost emails. This functionality significantly improves communications and ensures that emails are sent and received without any hitch or problem. System and network security remain a paramount concern for businesses. WebSitePulse scans your servers and firewalls and determines potential security threats by basing them on more than 60,000 known security issues and exploits. What Problems Will WebSitePulse Solve? Scenario 1: Your client’s website is being monitored from several location spread around the world. One of the nodes starts detecting a problem – a timeout error. The customer is being alerted, but when they check the website manually it seems to be working properly. However, their website is using a CDN provider and the content delivered to the various geographical locations is different. It is impossible for the customer to be aware at all times if their website is working properly everywhere in the world. This is where the system’s 40 different locations come to the rescue. Combined with check intervals as low as 1 minute, customers can be sure that if a problem occurs anywhere on the globe, WebSitePulse will be able to detect it. Promptly! Scenario 2: A client is running an online store. The website opens quickly and the items are shown correctly – it all seems to be working fine. But does the actual check-out process work and will the potential customer be able to order the items that he chose? This is where the system’s transaction monitoring comes in handy. WebSitePulse is able to create and then test complicated multi-step web transactions, which emulate a real user experience. Its monitoring node follows all steps that a real person would do – it opens the website, browses for a product, adds it to the cart, check outs, pays for the product and logs out. Testing the whole system from A-Z on a regular basis ensures that the system is functional as a whole and that potential customers will not face any issues while shopping. Scenario 3: Clients are running mission-critical websites or services. Avoiding downtime is always a good practice, but even the best of websites go down occasionally. It then all comes to minimizing the downtime by taking immediate action. WebSitePulse has a unique feature (Takeover) that lets you leave detailed instructions which our team will follow once the monitored website goes down. Its highly qualified personnel is working 24/7 and is able to react quickly and follow the instructions, which might require us to SSH to the server and reboot a service, call the hosting company and raise a ticket or start trying to contact a list of people until a live person is reached and has been notified of the problem. Enterprises have different wants and requirements and no software solution can be ideal in such a situation. It is useless to try to find an ideal out-of-the-box software system that fulfills all your business needs. The wise thing to do would be to modify the solution for your specific needs, staff member skill levels, budget, and other aspects. For these reasons, do not rush and subscribe to well-publicized popular applications. Though these may be widely used, they may not be the ideal fit for your particular wants. Do your research, look into each short-listed application in detail, read a few WebSitePulse reviews, call the seller for explanations, and finally settle for the product that provides what you need. How Much Does WebSitePulse Cost? We realize that when you make a decision to buy IT Management Software it’s important not only to see how experts evaluate it in their reviews, but also to find out if the real people and companies that buy it are actually satisfied with the product. That’s why we’ve created our behavior-based Customer Satisfaction Algorithm™ that gathers customer reviews, comments and WebSitePulse reviews across a wide range of social media sites. The data is then presented in an easy to digest form showing how many people had positive and negative experience with WebSitePulse. With that information at hand you should be equipped to make an informed buying decision that you won’t regret. What are WebSitePulse pricing details? What integrations are available for WebSitePulse? 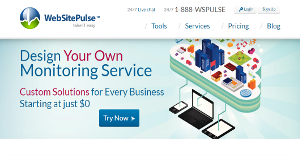 WebSitePulse integrates with all software and services which support API calls. If you need more information about WebSitePulse or you simply have a question let us know what you need and we’ll forward your request directly to the vendor.